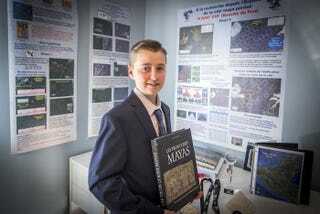 Last month, Canadian teen William Gadoury created a sensation by claiming to have discovered a lost Maya city using star maps. Experts said it was utter nonsense and quickly shrugged it off. Gadoury has now spoken to National Geographic, and it’s clear the teen is not backing down. To quickly recap, the 15-year-old Gadoury “discovered” the lost Maya city—which he dubbed K’aak Chi (meaning Mouth of Fire)—by correlating the locations of known settlements with the positions of the brightest stars. He received help from the Canadian Space Agency (which provided satellite images) and a remote sensing specialist from the University of New Brunswick. Experts say Gadoury is way off the mark. Some claim the features shown in the space-based photos are merely abandoned corn fields or possibly marijuana grow ops. What’s more, they argue that the Maya people, though good astronomers, probably did not choose to settle in areas based on the positions of the stars. Gadoury recently visited Washington DC, where National Geographic’s Kristin Romey had the chance to speak to him in person. Based on his responses (translated from French), it’s clear that this ambitious teen is not quite ready to back down. He’s still convinced, despite the vociferous criticism, that he’s on to something. “I know it’s not very good when I’m not accepted by critics, but it just helps me advance my research,” the teen told Romney. The student, who’s hoping to specialize in either astronomy or archaeology, wants to publish his findings in a scientific journal so that he “can share it with archaeologists and scientists.” He’s currently talking to one journal about writing for them. In response to the claim that his theory has been debunked, Gadoury didn’t mince his words. It looks like Gadoury’s wish will come true, but he better prepare himself for some disappointment. In the meantime, the teen should probably develop a sense of humility. Science is hard, and often full of setbacks.